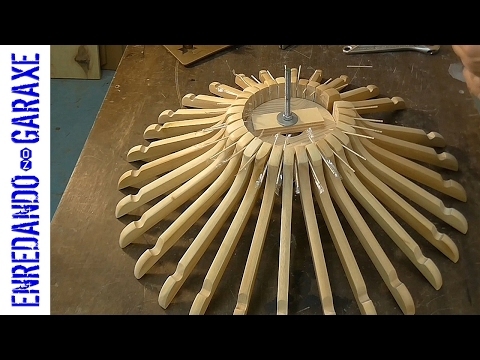 How to reuse wooden hangers to make a nice lamp. I show how to cut the wooden hangers in two, how to cut a wooden circle and how to drill all the holes we need to make dowel joints. Finally I put all the parts together, I varnish it and I show how nice this lamp looks. This is a great woodworking project you can make with recycled wooden hangers.